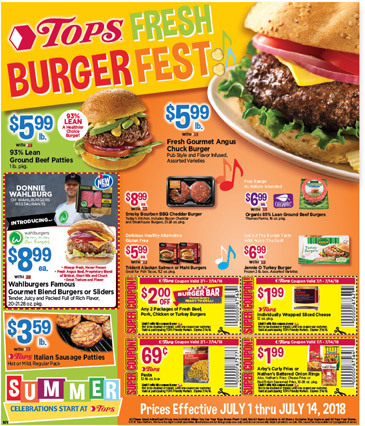 Tops Tops Markets Tops Burgerfest Store Coupons: Save on fresh burgers, pasta, fries, and cheese! Tops Burgerfest Store Coupons: Save on fresh burgers, pasta, fries, and cheese! Now through July 14, 2018 you can save even more at Tops with these store coupons, which you can print or simply show on your mobile device in order to get your discount.